Scientists may have discovered how the first sea creatures evolved to walk on land. We've all seen the evolutionary charts that show the progression from a single-celled organism, to a fish, a lizard, a mammal, a primate and then humans. Heck, even the Darwin fish on many a geek's car has limbs, but we hadn't figured out exactly how life on Earth evolved to grow the larger limbs that allow locomotion on dry land. 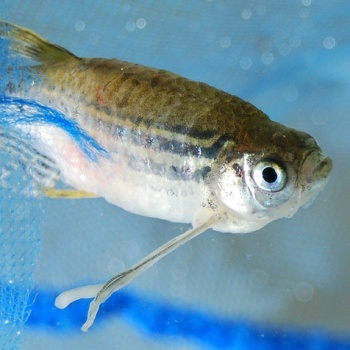 In a study published in the Developmental Cell journal this week, a group of researchers from the CSIC-Universidad Pablo de Olavide-Junta de AndalucÃ­a, in Seville, Spain may have discovered the chemical needed to produce the strong limbs a fish would need to move around without the water to support them. How do you figure this out? Well, you inject mouse genes into zebrafish. The study detailed how injecting large amounts of the hoxd13 gene, known to help cells differentiate between body parts as an embryo grows, actually increased cartilage growth in the fish. The resulting autopods - the term for limbs before they grow - replaced the fins a fish would normally sprout. The fish in the study continued growing the autopods before they died four days into the experiment, but the scientists think they've found an important evolutionary link. If fish could have naturally produced a lot more hoxd13 gene, then it's possible that's where limbs came from. "Of course, we haven't been able to grow hands," said Dr. Fernando Casares, but the experiment did prove the genetic mechanisms were in place in fish already. "We found that in the zebrafish, the mouse Hoxd13 control element was capable of driving gene expression in the distal fin rudiment. This result indicates that molecular machinery capable of activating this control element was also present in the last common ancestor of finned and legged animals and is proven by its remnants in zebrafish." Remember that the next time you order fish and chips you might be munching on your long lost relative. Mmm, so tasty. Please pass the vinegar.